It’s media week over here at Los Pollitos Dicen. Los Pollitos is featured in Find It! 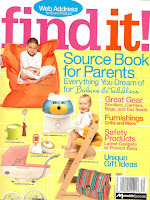 Source Book for Parents, published by the Meredith Corporation. It just hit bookstores. Inside, are lists and pictures of companies, big and small, hawking cute baby stuff. A lot of cute baby stuff. The book stays on the shelves for a year. Meredith, by the way, publishes Child, Parents, and Ser Padres, among many other great magazines. The in-box also brought a nice surprise from the fine folks at Hispanic.com. They’re featuring the Boonie Blog here and they have a running list of other Latino blogs worth a miradita. I got back to my writer roots and wrote a column for the March/April issue of Multilingual Living magazine. If you are raising a child to speak more than one language, the magazine is a source of inspiration and the site, Bilingual/Bicultural Family, is wonderful. Finally, the chicks are expected to be in the April issue of Tu Ciudad, the city mag in Los Angeles. You can read a great letter from the editor, Oscar Garza, here, and about the magazine as featured in the New York Times. We will return to stories about my genius child after the break.